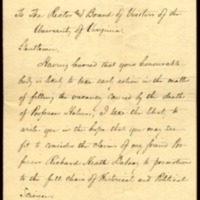 Woodrow Wilson’s letter of recommendation for his friend, history professor, Richard Heath Dabney. To the Rector and Board of Visitors of the University of Virginia. Having learned that your honourable body is likely to take early action in the matter of filling the vacancy caused by the death of Professor Holmes, I take the liberty to write you in the hope that you may see fit to consider the claims of my friend Professor Richard Heath Dabney to promotion to the full chair of Historical and Political Science. I have long known Professor Dabney and have long been familiar with his written work,—particularly with his “Causes of the French Revolution”; and I feel for him not only the strong affection springing from an almost life-long friendship, but also the admiration of a fellow-student, who knows the first class quality of his work. I cannot speak of Professor Dabney as a teacher, because I have never had the good fortune to be associated with him in academic work; but I know how well he is spoken of,—and I have no doubt his pupils can give the most unequivocal testimony to his strength in the class-room. I have the deepest affection for the University of Virginia, as all her sons must have; and I shall rejoice to see her advance and reward the sons who have been faithful in her service as they deserve. I know with what zeal and devotion,—I think I know with what scholarship, Professor Dabney has served her,—and I should rejoice to see him rewarded with what I feel sure he has earned. Wilson, Woodrow, 1856-1924, “Woodrow Wilson to Richard Heath Dabney,” 1897 December 5, WWP20447, University of Virginia Woodrow Wilson Letters, Woodrow Wilson Presidential Library & Museum, Staunton, Virginia.